Every April, animal lovers and the pet experts at Bosley’s and Pet Valu stores across North America, team up to lend a helping PAW to animal rescue charities and pets in need. So far, thanks to its annual April Pet Appreciation Month event, Bosley’s, Pet Valu and its customers have donated more than $3.3 million to North American animal rescue charities and found homes for over 3,100 pets. This year, Bosley’s and Pet Valu are upping the ante, with a bold $1.5 million fundraising goal, which will take total dollar and product donations up to $5 million in five years. “Now in its fifth year, Pet Appreciation Month raises much-needed money and supplies to support abandoned, homeless and abused animals in communities,” explains Julie Johnston, VP Marketing & Merchandising, Bosley’s and Pet Valu. “100% of the products and dollars raised are donated directly to pet charities, and money raised at our stores, stays in the local community,” adds Julie. • Just by commenting, liking, sharing, retweeting, or favouriting one of our #PostaPaw messages or creating your own using #PostaPaw, you will trigger a donation of 1 cup of pet food. Help us generate 15,000 cups of pet food for deserving pet rescues. Visit us at www.facebook.com/BosleysByPetValu or follow us on Twitter @bosleyspetstore to learn more. 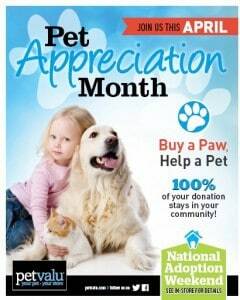 • Visit your local Bosley’s throughout the month of April, purchase and sign an official PAW for $1, $2, $5 or $10 – or make a product donation to local animal rescue charities. Pet Valu, Inc. www.petvalu.com is a Canadian specialty retailer of pet food and pet-related supplies with more than 600 stores across Canada and the US. The Pet Valu family of stores consists of Pet Valu Canada, Pet Valu US, Paulmac’s Pet Foods, Bosley’s by Pet Valu and Jack’s Pets.